Elliott Bros. Miniature Refracting Telescope and a Three-draw Scope, 30 Strand St. London, 7-in. 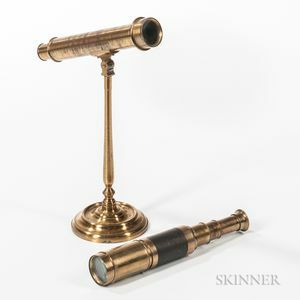 long main tube engraved "Elliott Bros./30 Strand London," with a triplet objective, mounted to a finely turned lead weighted base, and a brass and leather-wrapped scope marked "Battery Serg. Major H. Harris 1860."